The top two teams in our Kpreps Rankings the entire 2014 season remain unbeaten entering district play. Shawnee Mission East and Olathe North shared the Sunflower League title as the two teams do not meet during the regular season. The Lancers and Eagles highlight an eastern half of the bracket that contains four of the five ranked teams. In addition, another Sunflower League challenger has emerged in the Olathe South Falcons. South’s only loss came 27-26 in double overtime to Olathe North back in Week 3. After moving up from Class 5A this season, defending champion Blue Valley also remains in the 6A title hunt. The Tigers lone loss came 42-21 in Week 3. On the west side, Manhattan remains unbeaten despite needing every bit of the game clock to pull out two wins. The Indians scored with less than ten seconds remaining to beat Shawnee Heights (28-25), and got a game-winning field goal from Joe Trujillo with :02 seconds left to top Topeka Hayden (23-20). The Indians should get a big test from high-scoring Topeka High this week. The Trojans were blowing through all competition before a 28-21 overtime loss to Shawnee Heights a week ago. Shawnee Mission East (7-0, 1-0) – The Lancers enter district play ranked No. 1 in class 6A with a perfect 6-0 record and all six of those games have been blowouts. District play appears to go the same way as all three of SM East opponents are a combined 1-17. Expect the Lancers to use these games to prepare for a deep playoff run. Wyatt Edmisten leads the Lancer offense with 674 rushing yards and 16 touchdowns. Alec Dean has 431 receiving yards and six touchdowns, and quarterback Gunnar Englund has passed for 719 yards and nine scores. KC Wyandotte (1-5) – The Bulldogs are looking to make the state football playoffs for the first time since 2006. Wyandotte’s opening game against Shawnee Mission North will have a lot to do with if they have a shot to break the streak. The Bulldogs have rushed for 1,046 yards and six touchdowns this season. Steve Ford and Antonio Moore have rushed for 380 and 239 yards, respectively. Damian Reed has passed for 433 yards and eight touchdowns for the Bulldogs. KC Harmon (0-7, 0-1) – Harmon has lost 27 consecutive games and is looking to break the losing streak with a game against Shawnee Mission North. The Hawks struggle to score averaging 12.3 points per game. Darelle Alexander has been the Hawks leading rusher. Shawnee Mission North (0-6) – The Indians appear to be in the same boat as KC Harmon. SM North has lost 25 games in a row and the matchup with Harmon in week two of districts will have one of those teams break a long streak. Quarterback Will Schneider has thrown for 1,258 yards and 12 touchdowns. Nick Perez leads the Sunflower League in receiving with 34 catches for 625 yards and six scores. Key Games: (Week 7) Wyandotte at Shawnee Mission North should decide the runner-up spot. Shawnee Mission Northwest (2-4) – At 2-4 SM Northwest has a great chance to win the district 2 championship. The Cougars junior running back Duron Lowe leads the team with 454 rushing yards and four touchdowns. Senior back Sam Sullivan has added three rushing touchdowns as well. Shawnee Mission West (2-4) – The Vikings enter district play on a high note with an 18-7 win over Olathe East. Shawnee Mission West opens up with SM Northwest most likely to decide the district champion. Tarik Watson leads the Vikings with 476 rushing yards and three scores. Adam Rellihan has passed for 434 yards and five scores on the season. Blue Valley North (1-5) – Blue Valley North lost its first five games before beating Gardner Edgerton 31-15 to snap a 19-game losing streak. The Mustangs take on SM South to open up district play and a win over the Raiders could spark some momentum and allow the Mustangs to squeak into the playoff picture. Shawnee Mission South (1-5) – The Raiders started the season with a 41-12 thumping of SM North, but since then SM South has come out on the wrong end scoring a total of 29 points in the last five weeks. Slow starts have killed the Raiders so far and will have to refocus for the start of district play. Quarterback Matt Hollingsworth has thrown for 387 yards and two scores, but has completed only 38 percent of his passes. Blue Valley (5-1) – Ranked No. 3 in the state, the Tigers’ only loss came 42-21 to 4A Division I powerhouse Bishop Miege in Week 3. Blue Valley won the 5A state title last year. Colton McCumber has been an accurate passer for Blue Valley. Offensive lineman A.J. Harris is the state’s top-rated play and has committed to play at Missouri. Olathe South (5-1) – The fourth-ranked Falcons’ only loss came 27-26 in double overtime to rival Olathe North. Running back DaeVonte’ Nance rushed for 236 yards and two touchdowns during last week’s win over Lawrence. Nance has 403 yards and four scores on the season, second to Collin Fischer’s 448 yards and five scores. Olathe South will try to return to the playoffs after finishing 5-4 last season. Blue Valley Northwest (4-2) – The Huskies opened the season with a 1-2 record after losses to Bishop Miege and St. Thomas Aquinas. They have bounced back to win their past three and look to return to the playoffs after finishing 7-3 last year. Senior Miles Alexander is among the state’s top running backs. He has rushed for 777 yards and nine touchdowns this season. Gardner-Edgerton (0-6) – It has been a disappointing season for the Trailblazers to say the least. A year after going 8-2, Gardner-Edgerton has lost every game by 13 points or more. Jadon Pearson-Bruce has led the Blazers in rushing with 589 yards and two touchdowns. Olathe North (6-0) – Everyone agrees that the Eagles are loaded with talent, but many are surprised to see they’ve struggled at times this season. Despite being undefeated, Olathe North won its first three games by single digits. Since, the Eagles have gained momentum behind running back Venus Triplett. Triplett has rushed for 768 yards and 11 touchdowns. Olathe Northwest (4-2) – The Ravens will try and make the playoffs for the first time in three years. Northwest is led by quarterback Jack Hatzfield who has thrown for 557 yards and four scores. Northwest’s two losses have come to unbeaten Hays (12-10) and No. 4 Olathe South (35-14). Lawrence (3-3) – Lawrence running back J.D. Woods leads the Sunflower League in rushing with 837 yards and 11 touchdowns on 122 carries. Woods is averaging 7.2 yards per attempt. Lawrence will travel to Olathe North, but get Northwest and East at home. Olathe East (3-3) – Jeff Meyers’ Hawks have dropped two straight games after beginning the season 3-1. Jalen Branson has had a solid season with 535 rushing yards and five scores. Chase Miller has passed for 736 yards and six scores, but needs to improve upon a 41 percent completion percentage. Zach Cahill leads East in receiving with 367 yards and five scores. Manhattan (6-0) – Manhattan has won or shared the Centennial League title in each of the past five seasons. The Indians are unbeaten thanks to a defense that has allowed only 12 points per game and some late-game heroics. Manhattan’s Joe Truillo kicked a 28-yard field goal with :02 seconds left to beat Topeka Hayden (23-20), and Chris Martin scored with under 10 seconds remaining to top Shawnee Heights (28-25). Topeka High (5-1) – The Trojans have averaged nearly 57 points per game thus far this season. Topeka High dropped their first game in overtime to Shawnee Heights last week. Trojan quarterback Alec Beatty is one of the state’s finest signal-callers. Lawrence Free State (3-3) – The Firebirds rebounded from consecutive losses to beat Shawnee Mission South, 21-6. Quarterback Bryce Torneden has passed for 365 yards and three scores, while rushing for 675 yards and eight touchdowns. Washburn Rural (2-4) – Rural is off to a 2-4 start with three of those losses coming by a touchdown or less. The Junior Blues snapped a long playoff drought in 2011, and would like to get back to the postseason. 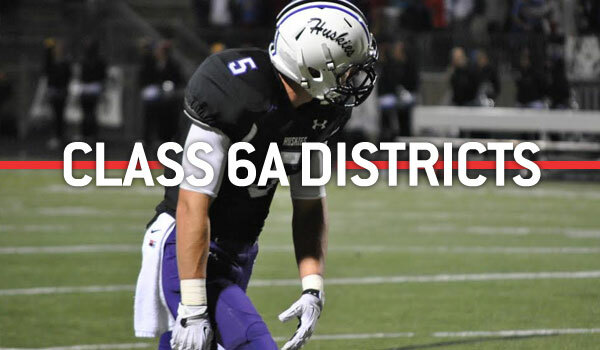 Quarterback Blake Peterson is an exceptional player that has committed to Texas State. Key Games: (Week 7) Topeka High at Manhattan; (Week 8) Free State at Manhattan (Week 9) Free State at Topeka High. Junction City (4-2) – After finishing 6-3 and missing the playoffs in each of the past three seasons, the Blue Jays are heavily favored to return to the 6A postseason this year. Junction City was moved from their normal place in District 5 to a district with Wichita City League schools. Randall Zimmerman’s bunch has dropped two games by 8 and 9 points, respectively. Wichita East (3-4, 1-0) – One of the Blue Aces wins came this week when it was announced that Wichita West would forfeit their 46-7 victory over East for use of an ineligible player. The Aces opened district play on Thursday with a 50-7 win over North in which quarterback Dominic Webb passes for 280 yards and six touchdowns. Wichita North (1-6, 0-1) – North’s one win came via forfeit due to Wichita West’s ineligible player. The Redskins actually lost to the Pioneers on the field, 66-0. North has only scored five touchdowns in seven games and is surrendering 49 points per game. Wichita Southeast (0-6) – Southeast is winless through six weeks and has been shut out three times. The competition has been fairly stout, however. The Golden Buffaloes’ six opponents carry a combined 26-10 record after six weeks. Key Games: (Week 9) Wichita East at Wichita Southeast will likely decide the district runner-up spot. Derby (5-1) – Derby returned no offensive starters and two defensive starters from the Class 6A state championship team, but has been one of Class 6A’s top squad. The Panthers stand No. 4 in Class 6A with 208 points scored. Transfer running back Curtis Whitten has led the offense. Wichita South (2-4) – South has exceeded its win total from last season's 1-8 mark. Opponents have outscored West 237-94. South’s four losses have come by at least 19 points, though the Titans defeated Wichita North 42-14 in Week 1, and Southeast 24-13 in Week 3. Wichita West (0-6) – West had to forfeit two wins because of using an ineligible player in Week 2 against Wichita North (66-0) and Week 3 versus Wichita East (46-7) and is technically 0-6. The Pioneer player participated in the first five games. West has outscored opponents 151-146 and has played the No. 8 SOS in Class 6A this season. West is expected to face no further penalties. Haysville Campus (0-6) – Campus has struggled throughout the season and opponents have outscored the Colts 302-94. Campus has just one victory in the last seasons. Key Games: (Week 7) Wichita West vs. Wichita South will be for the runner-up spot. Wichita Northwest (5-1) – Led by coach Steve Martin and speedster running back Keshaun McGaugh, Wichita Northwest has already matched last season’s win total. Northwest is ranked No. 2 in scoring offense (250 points) in Class 6A. The Grizzlies’ only loss was a 43-14 Week 1 loss to Bishop Carroll, ranked No. 1 in Class 5A. McGaugh rushed for 299 yards earlier this season against Kapaun Mt. Carmel and had just one negative carry in his first 73 carries. He has led the City League in rushing most of the fall. The Grizzlies will have to do without talented quarterback Kevin Folsum after he suffered a broken ankle in Week 5. Dodge City (4-2) – Dodge City finished second in the WAC after a road loss to Hays High last Friday. The Red Demons have tallied 225 points this year, third in Class 6A, second-most in the conference, and have collected 418 yards per contest. Quarterback Caden Walters has passed for 1,856 yards with a 14/4 TD/INT ratio. Dayton McGroarty leads the conference with 526 receiving yards. He has rushed for 305 yards and 10 scores. Garden City (3-3) – Caleb Tramp has 28 catches for 503 receiving yards and eight scores to lead the WAC in all categories. Jared Koster has rushed for 832 yards. Hutchinson (2-4) – Hutchinson has struggled with injuries under first-year coach Ryan Cornelsen. Cornelsen has never had a losing season in his entire football career – player, assistant and head coach – and is 90-29 as a head coach in his career. The Salthawks have played the No. 4 SOS in Class 6A much stronger than Northwest (28), Garden City (24) and Dodge City (20). Running back Blaik Middleton has rushed for 1,005 yards, including games with 232 and 282 yards. Key Games: All games will be key in a competitive district.